Purex is supporting Make-A-Wish the month of February. To honor the millions of children whose clothes Purex helps keep bright and clean every year, the Purex brand is teaming up with Make-A-Wish to bring bright wishes to children with life-threatening medical conditions. Purex will pay a minimum guarantee of $250,000 to Make-A-Wish…Here’s how you can HELP, you can help make a difference and get the payment up to $400,000 by purchasing Purex liquid detergent or liquid fabric softener between February 1st 2014 and February 28th 2014. Now, how about that GIVEAWAY?! 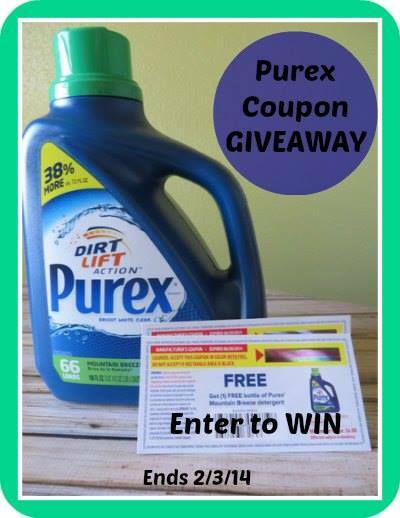 One lucky winner will win TWO Product FREE Coupons for Purex Mountain Breeze Laundry Detergent! I like the Purex Crystals. They leave my clothing smelling so good! I was impressed with their , crystals. They work nicely. My favorite product is Purex Mountain Breeze Detergent. I love the liquid fabric softner. I like the Purex with Oxi . I like the Purex Free and Clear laundry detergent. Good, clean, and scent free! I love Purex Mountain Breeze. It smells so good. I like the Purex with Zout. I love Purex. I use it all the time. Purex Laundry detergent with zout is my favorite. The Purex Natural Elements series…I love the way these smell! I like the Purex Mountain Breeze. I like the Purex baby softener crystals, they make your laundry smell great. I use Purex with Oxi. I like the Purex Oxi detergent. Purex liquid laundry soap is my favorite. I like the Purex Crystals. They leave my laundry smelling really good. Purex Liquid Laundry Detergent is my favorite Purex Product! I most like the Purex with Oxi and the Purex Crystals. We use the power pax. I like ur purex laundry det.. I love the sheets that go in the washer & also in the dryer. I like the Purex Lavender Scent detergent. I like the Regular Purex Liquid Detergent. I like the Purex Crystals. I love the Baby scent Purex crystals because they smell great and are hypoallergenic! I like the pods you can toss right in the laundry – no measuring! I always use the liquid laundry soap. It usually costs less than other brands and works well. I like the ultra packs. I like many of their products but the Purex with Oxi is my favorite. My favorite is the Purex Crystals! The Purex liquid is what we like. We love the Purex liquids. Purex Oxi is my favorite. the Purex packs for laundry. I like the Purex UltraPacks Detergent. My favorite Purex product are the UltraPacks Detergent. I like the Fels Naptha bars. I just started using the Dryer Sheets and I really like them. I like their indidial pods for the laundry. I like original purex powder. i’venever used a purex product but i would love to try this!